Pub on Bankside near London Bridge Station. It was refurbished in May/June 2008, and is now badged as Taylor Walker, the premium end of Spirit Pub Company pubs. The best thing about it is the large seating area outside, over a couple of levels, right next to the river. The pub itself is not what it used to be some years ago, but still good for sitting outside with a beer in the summer — as long as you get there early to grab a seat, and don't mind the rather clueless service. Inside there are a number of levels, and plenty of seating. There's a restaurant area on the top floor, while the seating area by the outside terrace appears to keep its door open even in Winter, which makes the room rather cold. Takeaway fish and chips packaged in cardboard boxes is available upstairs. At the bar, a range of ales is available on handpump, covering the basic options. On Ewan's visit, these included Young's Gold, Bombardier and some others. The main bar is on the right of the building as you enter. They have a separate bar (which they call the Cask Ale Bar) down some steps, but this is not always open, and there is no signage to indicate whether or not it is. The food menu is standard Spirit Group pub grub fare, with an emphasis on fish and chips. Ewan tried this on his October 2012 visit. The size of the portion was reasonable, but the fish was unmemorable, and the peas were disappointing. 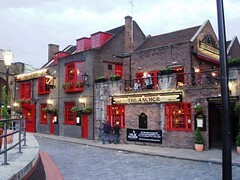 Ewan's verdict: For a pub which trades on its long history (opened 1615 according to the website), this is a fairly soulless place catering to tourist crowds along this stretch of the river. The service is patchy, and customers seated upstairs are expected to collect their food orders when they're ready (and when paying, the system still prompts to leave a tip). That said, the outdoor terraces are pleasant in summer, but in winter, the adjoining inside seating gets very cold from the open doors. Last visited by Ewan, Kerry and others, October 2012. Opening hours taken from website, October 2012. Last edited 2013-05-10 06:41:08 (version 26; diff). List all versions. Page last edited 2013-05-10 06:41:08 (version 26).